Get a word count of stories in your publication by editing the story in Microsoft Word. To do this, you need to first customize the Quick Access Toolbar (QAT) to include the Edit Story in Microsoft Word button. Click on the drop-down arrow to the right of the QAT. In the Publisher Options dialog, change the Choose commands from drop-down men to select Commands Not in the Ribbon. Scroll down and select Edit Story in Microsoft Word, click the Add button, and then click OK.
1. In your publication, click the text box that contains the words you want to count. If the text box is connected to other text boxes, all the words in the connected text boxes are counted. 2. Click the Edit Story in Microsoft Word button. 3. In Word, the word count will appear on the status bar at the bottom of the workspace. 4. In Word, click the File tab and then click Close to return to your publication. 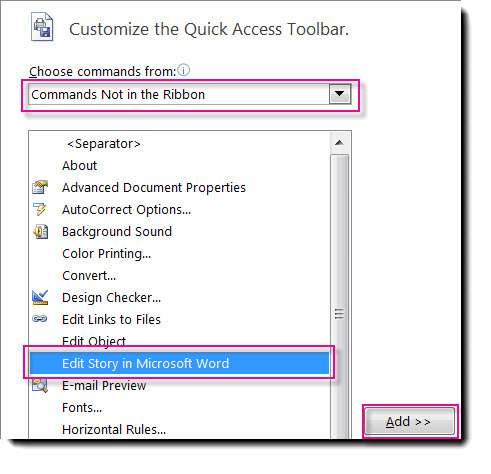 Tip: You can also customize the ribbon to include the Edit Story in Microsoft Word button. For how to do this, see: Customize the ribbon. Note: Before you can use the Edit Story in Microsoft Word, button you need to add the button to the ribbon or the Quick Access Toolbar. Before you can use the Edit Story in Microsoft Word button you need to add the button to the ribbon or the Quick Access Toolbar. Click the File tab to open the Backstage View. In the Publisher Options dialog, select Customize Ribbon. In the Customize the Ribbon drop-down menu, select Tool Tabs and then click Format under Text Box Tools. Click the New Group button then click the Rename button. Give your new custom group a name, such as Editing and click OK. Select Edit Story in Microsoft Word and then click the Add button. Click on the drop-down to the right of the QAT. In your publication, click the text box that contains the words you want to count. If the text box is connected to other text boxes, all the words in the connected text boxes are counted. Click the Edit Story in Microsoft Word button. In Word the word count will appear on the status bar at the bottom of the workspace. In Word, click the File tab and then click Close to return to your publication.